A tiller basically works the same as a plough. It turns over the soil, exposing the nutrients and allowing the plants to feed on them. A tiller is usually used to prepare the soil pre-planting. Cultivators do the same thing but are only suitable for small jobs. If you want to prepare a larger area of soil in your garden, a tiller is your best option. Front tine tillers have two tines located in front of its wheels that rotate in a forward direction. You can tilt the handles backward lifting the front of the tiller when moving it around and tilt it back forward when you want to use it. Front tine tillers are usually the least powerful type but also the cheapest. Rear tine tillers have their blades behind the wheels. They are more powerful and dig deeper than front tine tillers. Different models of these tillers have blades that rotate in various directions. Some rotate forward like the front tine tiller, some in opposite directions. Rear tine tillers are better for tackling tough soil and breaking new ground. Vertical line tillers are the most recent and least common type of tiller out there. They differ from the others in that the tines cut forward instead of downward making them more efficient. 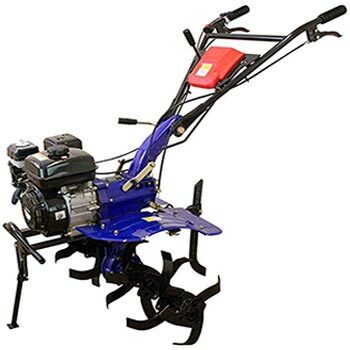 The type of tiller you will need is dependent on a host of factors such as garden size, soil type, how deep you want to dig, and of course your budget as the price range is quite wide. You should also consider things like maintenance costs, what special features would be helpful for you, and your available storage space. Here I have included some reviews for different types of tillers available in the UK at the moment. Hopefully, you’ll find them helpful. Here are my picks for the best garden tillers in various categories. We will start with the best electric tiller for sale under £100. Let’s take a look. 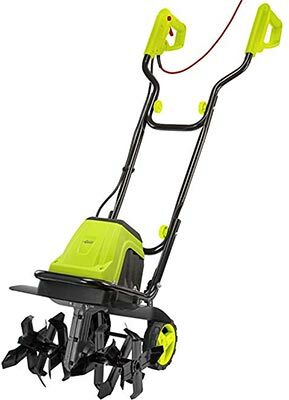 Priced at a penny under 80 pounds, this electric garden tiller, brought to us by its makers The Handy, gives you excellent value for money. This electric garden tiller is perfect for prepping small to medium sized flower beds and vegetable patches, and works to a maximum depth of 20cm and a width of 30cm. For most average sized gardens, this is enough to keep you happy. The blades are powered by an 800 watt electric motor that does a good job of providing enough power to till heavy soil without too much bother. 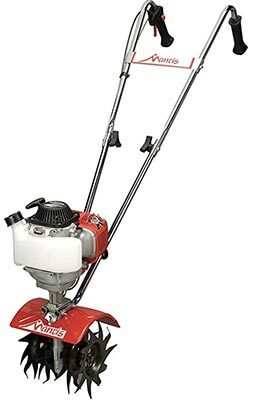 Please bear in mind that despite this electric tiller performing well, it isn’t a heavy duty, industrial model so you will have to remove any large stones out of its path or the blades could get jammed, or the stone could be sent flying out and potentially causing injury. Saying that, it doesn’t seem to have any problems with shifting very small stones. It’s clear to me that The Handy electric garden tiller has been made to be used by everyone, including people with no experience. Setting the tiller up is as simple as attaching the handles and securing the wires. This can be done with minimal effort with the only a screwdriver and spanner. Operating this electric tiller is even easier than setting it up. On the handle there is a trigger which you squeeze to start the tines rotating, to stop you simply release the trigger. Being designed for regular sized garden use, the power cable that comes with the tiller is 10 metres long. If you have a particularly long yard, the addition of an extension cable will be more than enough range for you. Living up to its name, this garden tiller has some nice, ‘handy’ features. For a start, the tines can be removed by taking out a pin, so you can keep the blades sharp and prolong the working life of the tines. There is also a thermal protection feature, where the machine detects when the motor is under too much strain and overheating and switch itself off. It’s very easy to get a stone stuck in the blade and not realize that it is jamming it. This feature prevents that from happening. Despite not having any wheels, moving this product around won’t cause any problems for anyone as it only weighs 9.7 kilograms. Easy storage is helped along by the compact design and also the foldable handles. The one thing I will say that this electric tiller needs is a way to come on the power gradually. As it is now, the power comes on suddenly and can catch you by surprise the first time. If you’re looking for a well performing, electric tiller for an average sized garden that won’t leave you bankrupt, The Handy Electric Garden Tiller is for you. It would have been nice if it was fitted with wheels but it is very lightweight and gets around easily enough. Here are two electric tillers for sale for under £150 that are my choices for the cream of the crop in that price range. The Garden Gear electric garden tiller is for sale at £124.99, and with that price you get a 2 year guarantee. A powerful 1400 watt electric motor drives the 6 tines at 380 rpm, making light work of tilling tough soil, clearing weeds, digging holes and much more. The tines are built to last and are made of hard wearing material. They can cultivate up to 22cm deep and 40cm wide which makes it handy for getting into harder to reach areas that larger tillers can’t. At just over 12 kilograms in weight, this electric tiller won’t be breaking your back anytime soon. Being fitted with plastic wheels it is easy to move around by simply tilting it back. This lifts the blades of the tiller out of the ground at the same time. This electric tiller has a couple of safety features, such as a 2 point safety switch which brings the tines to a dead stop the moment you release the trigger, and an overheat protection system to protect the motor. My initial observations on the build quality is that it is good and robust enough to last a fair while. 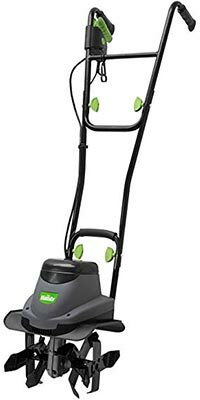 The Garden Gear electric tiller comes partly assembled to make setting up easier and faster and the 10 metre long power cable included in the box should give enough length from the power socket for most people. Garden Gear’s 1400 watt electric tiller is a great bit of kit at a very reasonable price. I couldn’t find much to fault it on except for the small wheels. 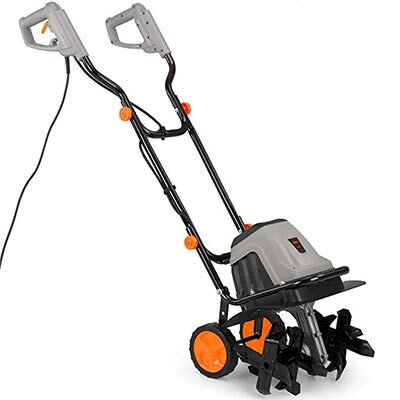 Well known Brand VonHaus bring us a product which on paper is almost identical to the Garden Gear electric tiller we just reviewed for a price that is around 15 pounds cheaper. Like the Garden Gear tiller it is powered by a 1400 watt electrical motor, but has a lower RPM of 280. The Von Haus also has 6 blades and the cutting width and depth is the same as our previous review, 40cm wide and 22cm deep. This product is powerful and performs well on most soil, but I found that for clay, the garden needed to be prepped a little beforehand or it wouldn’t work as efficiently as designed. It weighs a kilogram less than its rival at only 11kg and is very easy to set up. You should be up and tilling in about 5 minutes. Be careful when starting this tiller up though, as like the other 2 electric models we reviewed, there is no power control and it comes on very quickly. The VonHaus 1400W electric tiller offers the same safety features too, namely a safety shut off switch and a thermal protection system to shut down the motor if it sense that the temperature is too high. All fairly standard these days. This electric tiller comes with a 10 metre long power chord and a 2 year warranty. Mantis is one of, if not the most, well known and popular brands out there. They have a wide range of best-selling products and are renowned for the build quality of their products. This particular model is aimed at people who still want the lightweight manoeuvrability of a compact electrical tiller but with the power that only comes from a petrol engine tiller. The compact design of this petrol tiller means it can used in narrow spaces and its 9cm cutting width is perfect for those with raised beds and patches. Still, its powerful 25cc Honda engine allows you to till a larger area of garden if need be. This Mantis petrol tiller is a great little performer and can dig down up to 10 inches even through hard clay, and if you are looking to shallow cultivate, you can reverse the tines and it will till up to 3 inches deep. This is perfect for getting rid of stubborn weeds. The tines themselves are extremely robust and Mantis is offering a lifetime guarantee on them breaking. There is also a 5 year consumer guarantee on the petrol tiller as a whole. The only thing I didn’t like about this petrol tiller is the inevitable noise, but that is to be expected with any petrol powered gardening product and a pair of ear protectors solves the problem. You also have to be careful with hard roots as they will jam the blades. This petrol garden tiller is designed for small to medium garden use, hence its compact and lightweight design. Priced at £399.99, it is far more expensive than a lot of electrical models of the same size but this petrol tiller offers much better performance. Have a larger garden than average and need to turn over a lot of soil in the shortest time possible? This is the machine for the job. It is priced at £429.99, making it cheaper than some models that only have half its cutting width. The T-mech petrol tiller has a 7 horsepower, 210cc 4 stroke engine that power the enormously wide 90cm tines at a maximum speed of 3600 RPM. Not only are they wide enough to make full garden, pre-turf tilling a piece of cake, they are also depth adjustable, so you can choose how deep you want to dig from 175mm – 350mm. There are 3 gears, forward, neutral, and reverse, giving you complete control over the machine at all times. Not happy with a spot you just passed? Slip it into reverse and go back to it. The T-mech petrol tiller is a monster and will comfortably turn over any type of soil that you put it on and should have you tilling about 0.45 – 1 acre per hour. The 3.5 litre petrol tank ensures that you don’t have to refill to often either. On the handle of the tiller is a handy tool box and the product comes with free safety equipment in the guise of safety glasses and gloves. The wheels to move this 55kg machine are proper air filled tyres and more than up to the task. There is also a 1 year warranty on this petrol tiller. The only flaw I found with the T-mech petrol tiller was that the instruction manual provided wasn’t that clear or easy to follow. 3 gears forward, neutral and reverse. There you have it, a nice short selection of garden tillers. There are larger industrial sized tillers that are more like farming ploughs for sale, but I chose to review these products as I thought this is what the majority of people would be looking for. Please check out our other articles on a wide range of gardening products.